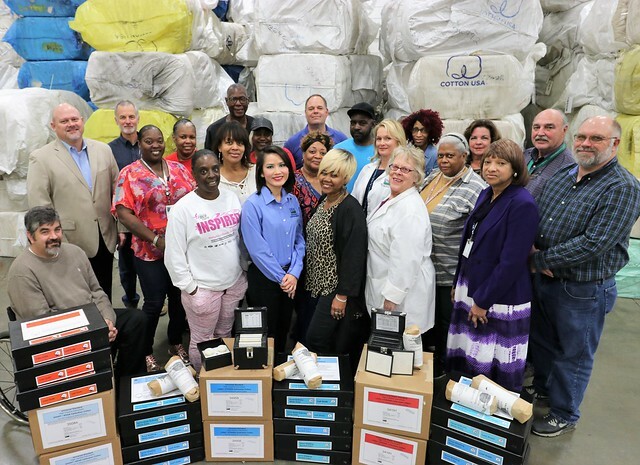 Members of the AMS Cotton and Tobacco Program’s Standardization and Engineering Division in Memphis, Tenn pictured with examples of physical standards made by their Division to be shipped internationally and bales of cotton used to make many of the standards shown. Despite its relatively small size and location in Memphis, Tennessee, the Agricultural Marketing Service, Standardization & Engineering Division (S&E) within the USDA Cotton & Tobacco Program (C&T) plays a giant role in both the U.S. and international cotton marketing systems. S&E produces and distributes physical cotton classification standards for all ten of the department’s cotton classification (grading) labs. These standards provide the physical references used to test and measure numerous fiber characteristics on all cotton produced in the U.S. each year - over 20 million bales in 2017-18 (over 10 billion pounds). The fiber properties determine the market value of the cotton for the farmer as well as the end use of the cotton at the spinning mill. It is imperative that all testing instruments and human classers are extremely accurate at all times, and the standards provided by S&E are the basis for ensuring that accuracy. The USDA standards produced annually by S&E have served as the basis for cotton classification in the USDA cotton grading system since 1908. In addition to supplying cotton standards for USDA labs, S&E fills approximately 500 cotton standards orders annually to hundreds of cotton testing labs from more than 50 countries. The USDA standards are globally recognized as the international standard for cotton testing and are therefore found in practically every testing laboratory around the world. For the 100-million plus bales of cotton produced in the world each year, the USDA cotton standards serve as the primary valuation reference and facilitator of trade for a world cotton crop valued at more than $30 billion. In total, more than 75,000 pounds of the USDA cotton standards are distributed annually with the largest customer countries outside of the U.S. being China, India, Australia and Brazil. All of these standards are made and distributed from Memphis, the only place in the world that makes them. Production of the cotton standards starts with acquiring high quality cotton fiber material from the U.S. cotton crop each year followed by extensive testing in multiple laboratories designated for the purpose of establishing precise cotton property values. Cotton materials to be used as instrument calibration standards must meet stringent property requirements before they are approved and packaged as “the” USDA cotton calibration standards. Cotton materials for visual grade standards used by human classers are meticulously hand crafted to represent the various grade levels for cotton color and leaf content. This process is often as much of an art as it is science. C&T’s promotion of USDA cotton standards is a continuous endeavor. The traditional method of cotton grading worldwide remains manual grading performed by a human cotton classer. As the world follows C&T’s lead in transitioning from cotton grading by classer to instrument, it is essential that accurate and precise standards are used and the users are properly trained. S&E conducts international workshops each year for new users on instrument-based cotton classification. These workshops cover proper methods in calibration and verification as well as best practices in instrument testing and maintenance procedures. USDA cotton standards have maintained the trust of the cotton industry for more than 100 years as substantiated by overall acceptance across the various cotton industry segments throughout the world. The entire cotton segment chain including cotton farmers, ginners, warehouses, merchants and textile manufacturers use and trust the USDA cotton standards to provide the basis for trade as cotton flows through the supply chain from the cotton field to the finished cotton textile product. This is all made possible because of the talented staff in the USDA Cotton and Tobacco Program’s Standardization and Engineering Division.